Michael Schmidt was born in Canada. He studied History and English at the University of Toronto and Painting and Illustration at Ontario's Sheridan College. Michael moved to Saint Paul in 1993 and worked as an illustrator and scenic painter before becoming a full-time artist six years ago. His work has been exhibited in solo and group shows throughout the Twin Cities. Michael's paintings are found in private and corporate collections in the U.S., Canada and Great Britain. My paintings are about the act of painting as much as they are about any specific subject matter. I usually choose mundane, everyday subjects as the starting point for my paintings. Anonymous urban landscapes and everyday objects are common themes. I see my work as primarily abstract art. I am more interested in composition, color, texture and rhythm as much as I am about any real narrative in my work. I am currently working on a series of semi-abstract urban-themed canvases as well as a series of paintings inspired by the waves and shoreline of Lake Superior. In these new paintings, the subject matter disappears almost completely. My hope is that my artwork gives the viewer the chance to slow down and take a second look at the world around them. We are surrounded by interesting visual experiences in the most common places. I have had people tell me that after seeing my urban artwork, they never looked at a power-line or water tower the same way again. I also hope that the viewer takes the time to get a little closer to my paintings, lets the subject matter disappear and appreciates the way the paint is applied. I had an art teacher in college who always went on about the "miles and miles of canvas" we would have to go through if we were serious about painting. I am beginning to understand what she meant. Art is something you have to devote yourself to for an entire lifetime. I am fortunate to have an easy 40 foot commute to my backyard studio in Saint Paul each day. Once the family is off to work and school, I bring my cup of coffee out to the studio, put on some music and start painting. I usually have two or three paintings on the go, with a couple more in the idea stages, so I am never at a loss for something to do each day. I work with oil paint and wax medium applied with large scraper tools and palette knives. My paintings develop pretty quickly. I often find myself racing against the clock as I like to keep a wet and workable paint surface. 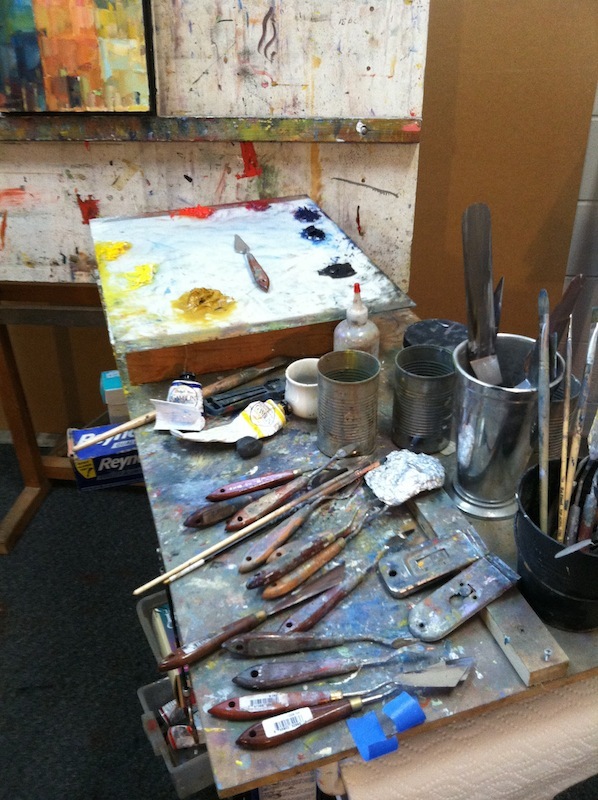 I also share a studio space in the Northrup King Building in Minneapolis. I use this studio occasionally to work in, but more as a place to exhibit my paintings as well as a great venue to connect with the public and other artists. An easy and obvious answer would be The Minneapolis Institute of Art http://www.artsmia.org/ Every time I visit the M.I.A. I am reminded how fortunate we are to have a world class art museum in our city (and a free one at that). Every time I visit I find something new. Lately the contemporary galleries, especially the Minnesota Artist Exhibition Galleries have been very impressive.